The Bible version issue will always cause division. Should it? Should believers separate from one another over what English (or Spanish) translation of the Bible they use? The answers to these questions have been percolating for awhile among fundamentalists. Certain recent events have caused the temperature to rise and some bubbling on the surface. Northland and Matt Olson invited Rick Holland to preach in chapel. Kevin Bauder and Dave Doran are joining Mark Dever on the platform of Tim Jordan and Calvary Baptist Theological Seminary. To explain, Matt Olson sends out a public letter and preaches a couple of chapel sermons, and Kevin Bauder writes a now 24 part series, which publishes at SharperIron. How do these relate to the Bible version issue? That's probably hard to figure out if you didn't know fundamentalist politics. Here's the gist of it: KJVO (King James Version Only) fundamentalists are worse than Holland and Dever, which explains Bauder and Olson's fellowship with Holland and Dever---if fundamentalism doesn't cut out its KJVOists then Holland and Dever shouldn't be a problem. Or stated differently: if they're closer to Holland and Dever than these KJVOists, then they'll just get together with Holland and Dever. If someone is going to criticize them for Holland and Dever, then someone may need to criticize John Vaughn for preaching with Clarence Sexton and Jack Schaap. So there we go. I don't really care if Northland has Olson or Bauder speaks with Dever. I don't. It doesn't change anything for me as it relates to those two men and their institutions. However, I have to say something about the way the Bible version issue is being represented as a part of their explanation for getting there. I see at least four parts to the problem. Not necessarily in this order, but, first, schismatics, second, bibliology, third, history, and, fourth, stupidity. These events and then proceeding debate indicates the impossibility in fundamentalism to sort out unity and separation. In the debate that followed the publishing of Bauder's article at SharperIron, the charge of schismaticism against KJVOers was used as a reason for separating from them. In other words, many KJVOers are schismatics, that is, they cause division over the Bible version issue. The correct position would be not dividing over differences in Bible version. According to them, it is permissible to divide over certain doctrines, but not that one. If you do, you're a schismatic. The real issue is divisiveness. If a KJVOer mistakenly believes only one translation has value, it is a relatively minor problem. If he is divisive, demanding that everyone agree, etc, the minor problem becomes major. But the problem isn't really his view on translations, but his divisiveness -- a problem of the heart not the head, a problem of pride. I believe this comment represents what fundamentalists are saying about schismatics over Bible versions. Is what he writes true? He is saying that differing on the Word of God is acceptable, but dividing over it isn't. He is saying that you're not wrong to differ on what the Word of God is, but you are wrong to divide over the differences. He is saying that you can't divide over the usage of the ESV or NIV without being a schismatic. Why? Where does Scripture tell us this? What passage in the Bible do we base this upon? I'd like to know. From reading Bauder's latest article, I'm supposed to understand that we've got no problem with fellowship despite a different mode or recipient of baptism, but I do if I separate over Bible versions. And none of this is supposed to be confusing? It's only not confusing if you have a handle on fundamentalist politics. Knowing the Bible won't help you at all with getting how they come to make their decisions on separation and unity. "Schismatic" relates to division, and division is a church (local) issue---period. A heretic, a schismatic, causes division in his church (see Titus 3:10-11). Division in "fundamentalism" or "evangelicalism" or in a certain branch of fundamentalism isn't heresy or schismaticism. They throw schismatic around like the pope threw around the term "heretic" during the Spanish inquisition. These people want to bring people into line with their own sacral society with their use of the label "heretic" or "schismatic," just like the pope did. I suggest that everyone just ignore this concept of division or heresy or schismatic. This fundamentalist false view of unity is much more dangerous than a division over Bible versions. These are men that can't persuade of their position on Bible versions, so they use these labels to frighten people, just like the pope did. The issue of Bible versions is a matter of faith. #1, does the Bible teach that God would preserve every Word? Answer: yes. #2, does the Bible teach that every Word would be available for every Christian of every generation? Answer: yes. #3, does the Bible teach that God's Word would be perfect? Answer: yes. If you have the text behind a version with 7% variation from another one, they can't both be the same. With what I see the Bible teach about preservation, I can't overlook the variation. I can't say they are the same. I won't say they are the same. I won't say they are the same like I won't say that rock music and classical music are the same. They are not. I can't say the differences don't matter. God inspired every Word. There is no way that the text that is the basis for the modern versions could be the Words of God. They can't. They weren't available for hundreds and hundreds of years. That would conflict with what the Bible teaches about its own preservation. I believe the original Hebrew text (of 1 Samuel 13:1) also reads “thirty,” even though we do not currently possess a Hebrew manuscript with that reading. So they don't even believe #1. And they don't believe #2 and #3. And what do #1, #2, and #3 have to do with the authority of Scripture? They would say that the errors in what they possess don't affect authority. They know they do. Everyone knows they do. The uncertainty about the Words takes away from authority. You get beliefs #1, #2, and #3 from Scripture. So if you don't believe those, where are you getting your beliefs on those? You aren't getting them from the Bible. They get upset if we say they are getting them from rationalism, when there seems to be a load of evidence that say they do. Does it matter how they got them? I think it would be helpful for them to try to connect the dots. I think they are easy to connect, but why not start with placing faith in what God said? So when I separate, I separate over these doctrines. You can't be a modern or multiple version person and not reject at least #2 and #3. 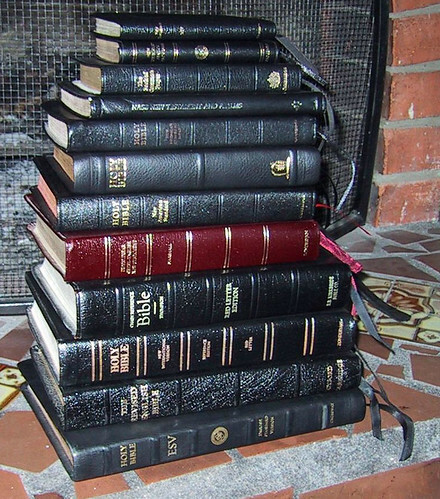 Is less than a perfect Bible a separating issue? Doesn't a rejection of those doctrines reflect on the veracity of God too, since He inspired those doctrines? Will propagating a false doctrine or even just accepting a false doctrine on these have an impact on people? Does it affect the Great Commission, which says that we are to teach the new believers all things that Jesus commanded? If we get blessing from reading all the Words of the prophecy of Revelation (1:3), will people not get the blessing God promised if they read only some of the Words? The FBFI affirms the orthodox, historic, and, most importantly, Biblical doctrine of inspiration, affirming everything the Bible claims for itself, and rejecting, as a violation of Revelation 22:18-19, any so-called doctrine, teaching, or position concerning inspiration, preservation, or translation that goes beyond the specific claims of Scripture. The use of Revelation 22:18-19 is clever, especially since those verses warn against adding or taking away from the words of the book, not the doctrines of the book. They misuse a verse, which is actually about preservation of Scripture, against the doctrine of preservation. What they're saying, of course, is that the claim of perfect preservation of Scripture goes against the teaching of the Bible. I just wag my head. I believe that these bibliological doctrines are more important than my association with modern or multiple version men. What God said is more important than them. They can call me a schismatic. I'm sorry about that. I'm just not going to be able to allow that to have an effect on me. So I won't let it. Bauder's article pointed out that a significant element in the fundamental movement holds to the KJVO position and that some do so in such a fashion that is doctrinally aberrant or historically misinformed. I've read this type of comment from many fundamentalists. They are the ones who are either ignorant or rebellious against historical evidence. The modern or multiple version position is the new position. Every word perfection in the apographa is the historical position. It is true that fundamentalism has accepted critical text advocates, but that is a movement a little over 100 years old. That is the historical argument of God's Word in our Hands, of which Harding was one author, and then God's Word Preserved, by Mike Sproul. Their historical, textual arguments go back around a century. That's it. That doesn't present really any kind of historical argument. So they have a doctrine that isn't in the Bible and can't be backed up in history. Hundreds of young people are continually led astray and given a fraudulent view of history and Christian certainty of truth. The fraudulent view of history is the modern or multiple version position. It isn't found in Scripture or in history. Neither is it logical---two things that are different cannot be the same. It is true that men have written against the preservation of Scripture. They have also written against inspiration, against the deity of Christ, and against other true biblical doctrines. That doesn't make what they have written to be true. When you speak to Islamics, they are some of the greatest advocates of the critical text and copyist errors in the Bible. Their writings are in books, pamphlets, and all over the internet. Enough ink has been spilled on this issue to correct the problem, and yet the problem dogmatically persists. The KJVO movement in its various forms was never a part of historic, biblical fundamentalism. A regular feature of fundamentalist criticism of KJVO is that KJVOers are stupid. They try and try to explain, but these knuckleheads just don't get it. This is a fundamental aspect to the problem of fundamentalism with KJVO. The fellow KJVO fundamentalists make them look bad with their "fellow scholars." It is more important to fit into scholarship than just to believe the Bible and what it says about preservation. The same kind of criticism comes from scientists about young-earthers, who don't believe in evolution. The issues are very similar in nature. Both critical text supporters and old-earth creationists have altered the historical, biblical views to fit into science. They have changed doctrine in light of new human discovery. Intellectual pride always causes problems. It's a sin in itself, but it will result in further error, both doctrinal and practical. The arguments for the KJVO, and some KJVP, positions have now been thoroughly exposed and refuted many times. Yet the Pastors and leaders in the KJVO movement continue to side step common reality and seek to offer the same old mis information and factually wrong history. Here you get the same history criticism with the addition of a subtle stupidity one. KJVOers "side step common reality," even though their position has "been thoroughly exposed and refuted many times." The reason they don't change is because they need a scriptural position and explanation. They would also like to see where Christians have believed the same further back than 100-150 years. It's not because they are stupid. Churches will separate over doctrine and practice (Romans 16:17-18). They should. There is nothing more fundamental in the realm of separation over doctrine than "errors in Scripture." If someone says there are errors, our church says that is false doctrine. We will separate over that. We want to preserve and propagate the doctrine of preservation and availability and perfection of Scripture. One of the biblical means for doing that is separation. The most egregious error is the one that Sexton advocates. The New American Standard Version is the Word of God. The New International Version is the Word of God. The English Standard Version is the Word of God. For someone to insist that they are not is to show contempt for the Word of God. I believe that this is grave error, every bit as serious as anything that Billy Graham has done. In my opinion, this is mere game-playing. I think we have good reason not to share a platform or fellowship with Clarence Sexton that relates to defense of the gospel. However, if we were to say that the NASV was not the Word of God with the explanation that it comes from a corrupt text, a text not received but rejected by the churches, how does that not respect the Word of God? This is where we have game-playing on the part of Bauder. For instance, I would say that the NASV is the Word of God where it represents the text received by the churches, but not so where it has been corrupted. Do we have to call what we think is a corrupt text the Word of God? If not, we disrespect the Word of God? Wow. Who really is disrespecting the Word of God? I don't believe this is ultimately about the Bible or translations as it is holding together a coalition of men who use a wide variety of translations. Everyone must call each translation the equal, when they are actually not equal. They couldn't be, when they are different words. This is an attack on the inspiration, preservation, and authority of Scripture. Why? Because God inspired Words. Words that are different can't both be inspired. That is obvious, which is why what Bauder is doing is game playing. For instance, what if we added the apocrypha. Is that the Word of God? Are deletions or additions the Word of God? It seems that Kevin Bauder must have a faulty bibliology be the thing that he most seriously disrespects about Clarence Sexton, even though Sexton would probably say something similar to what I wrote about the NASV. And yet, the infant sprinkling of a Presbyterian is a lesser problem for him. Several comments to the last two Bauder articles say that the NKJV is the same text, the identical Greek words to the TR. This is an error that should stop. Jude 1:19, the MV/C text omits eautou ("themselves"), as does the NKJV. Acts 19:39, the the NKJV follows the MV/C text in "peraiterw" instead of "peri eterwn", subtle but different. Acts 19:9, the NKJV follows the MV/C text in omitting "tinos." Acts 17:14, the NKJV omits "as it were" ("ws" in the Greek) and thus once again follows the MV/C text. Acts 15:23, the NKJV follows the MV/C text in omitting "tade", or "after this manner." Acts 10:7 the NKJV follows the MV/C text in omitting "unto Cornelius" in the first clause. There is really no difference between a Ruckmanite and someone who believes that God's Word is preserved perfectly only in one of the TR texts. This is patently false. I won't call it a lie, just someone trying to say something impressively extreme, in complete ignorance. If you have the same words as the those originally inspired in the Greek and Hebrew, that is called preservation. The words don't need to be given by God again, because they already exist and have been preserved. The false doctrine of double inspiration deals with English words, because God didn't inspire English words. These types of errors are then congratulated and no one points out the error. And this group talks about false bibliology. Can they be trusted? Re:Addendum #2, I'd have to go back and dig it out (not something I'm eager to do), but at leaset one person stated that the NKJV diverges from the greek text "presumed to underlie the KJV" in some spots. I noticed because I was ready to point it out but didn't because (I thought) someone did. Also the failure to recognize a difference between your position and double inspiration is, well, a failure of understanding your posiont, double insp., or both. I can understand why that would frustrate. In point 2 you write that every word of God is "available" to every Christian in every generation. How are you defining availability? If you have a version with 7% variation from another one, they can't both be the same. With what I see the Bible teach about preservation, I can't overlook the variation. I can't say they are the same. I won't say they are the same. I won't say they are the same like I won't say that rock music and classical music are the same. They are not. I can't say the differences don't matter. God inspired every Word. it sounds like inspiration of the King James Version. In other words, it is understandable for their to be variation between versions, because they are translations, not inspired. So the differences between the versions are less important (not unimportant) than the differences between the underlying manuscripts. That is the way I see it (and of course I differ with you with respect to the manuscripts). But... if it is the ONE VERSION alone from which there is to be no deviation... wow! that seems like KJV inspiration. Not sure you are intending to say it that way, but that is the way it comes across. 1) Are you saying that there can be no new version (based on the TR) that would be acceptable? 2) Are you saying that prior to 1611 the English speaking people did not have the Word of God? The Wycliffe and Tyndale are quite different from the KJV. Not wanting to argue, but I don't think I have heard you state it that way before. It is a matter of hypocrisy for the critical text supporters to say that we are schismatics when they separate over the Bible issue just like we do. I cannot imagine a more important issue that the text of Holy Scripture. I also use the terminology, general accessibility. It is scriptural and historical doctrine. Saved people who would want access to all the Words would have access to them. I changed a few words to make it clearer for you, but if you take the whole article, you can see I'm talking about the underlying text. That should settle your questions. I believe in a perfect text. I agree. It seems to be a no-brainer to me. I think these men get what we're saying. Hi Kent, I appreciate the word changes. That is what I thought you held to. But it does raise this question for me. I understand that the NKJV is said to have used a slightly different text than the KJV. If a version were to use the exact same text as the KJV and was a faithful translation, would it be acceptable? There are a few issues that would make it acceptable to me, and it really should be more of a concern to those who accept whatever translation comes out there. First, what you said, faithful translation. Second, accepted by true churches. The Holy Spirit knows what He meant and He works through the church. I don't think it should be a translation accepted by the publishing house or the society of scholars, but by churches. I don't believe we need English translation after English translation after English translation and it becomes dangerous. With a good translation and the churches receptive, I too would be receptive. I believe what God inspired was in the languages in which those Words were written. I also believe that is what He preserved. Out of curiousity, I suspect when you say "the churches" there are criteria to be included in that group. What might they be? Hi Kent, I agree that we don't need English Translation after English Translation. There are certainly a lot of unnecessary translations available today. Of course, in a free society, who is to stop the proliferation? Thus we all need wisdom from above and great discernment. Churches that gladly receive His Word, that is, churches who wish to align themselves with the Word of God in doctrine, practice, and affections. Revelation 2 & 3 would be a guide. I believe NT churches have the Bible as sole authority, regenerate, immersed church membership, pastor and deacons, the two church offices, autonomous, separation personally and ecclesiastically, Immersion and Lord's Table, two church ordinances, Priesthood of the Believer/Soul Liberty. Interesting on the google situation. Thanks. Perhaps the problem rests within our definition of preservation. We think that God's Word is exactly found in a certain text etc. Show me in the KJV (and I do love my KJV. It's what I use. I am KJVese fluent!) where it expressly states that the KJV is the inspired, preserved Word of God for the English language. Show me one...one! You can't. That tradition or doctrine of man is opinion. A bunch of verses prove creation by God, deity of Christ, virgin birth, resurrection and so on. But none prove the opinion. Don't you dare use verses to show inspiration or preservation. I need specific verses (one would do) stating KJV, inspired, preserved, English language. Now back to the definition of preservation. God's Word will not pass of the earthly scene as Robespierre wanted or "The Book of Eli" illustrates. I don't think your line of reasoning is going to stand up. We believe in a 66 book NT canon, and we don't have a single verse that states it. Is that just opinion then? I think you are confused as to what Kent is arguing. We believe in the preservation of the text that underlies the KJV, and we believe the KJV is a faithful translation of that text. There are many Scriptures that show God would preserve all his words. There is a very new, modern view that God only preserved 93% of his words, and the rest we need scholars to figure out. When that view is rejected, and the Scriptures examined for direction as to what we should expect in the text of Scriptures, you end up with the Received Text. None of us here believe that the KJV is "inspired" directly. God didn't do a second work in 1611. If you do wish to meaningfully interact here, it will help you to understand where we are coming from. I strongly recommend "Thou Shalt Keep Them: A Biblical Theology of the Perfect Preservation of Scripture" to bring you up to speed. was not considered to be the schismatics. Hi saints. Interesting discussion. I wanted to point out that there is a whole lot more wrong with the NKJV(s) than just a few minor places where they did not follow the same underlying Greek text. A LOT more. Here are some of the things I have found. This is not a copy and paste from somebody else. Is the NKJV the infallible words of God? Not a Chance!